3D gamers edge gold award winner! finally we have a user-created quake 4 single player add-on level! eLusive, a member of the team working on the doom3 'return to hell' mod, has taken the time to craft a very nice little adventure for quake 4. his doom3 mapping influence can be felt in the atmosphere of this map, which is quite dark (in terms of lighting) and makes use of some excellently creepy ambient audio. the map opens up with a cut-scene that is typical of quake2/4 maps: you start in space, and end up crash landing on the surface of stroggos in your pod. you emerge from the wreckage armed with just a blaster, but you are quickly given a machinegun and then the battle begins. the action throughout this level is very well paced, with plenty of frantic fighting to keep you on your toes and just enough down-time for you to take a breather before you are once again under attack. eLusive manages the flow of this action very well, and you should never feel overwhelmed or bored. the challenge is fairly high but never frustrating. i only died once during my first play-through. ammo and weapons are scarce, and this will force you to think through your plan of attack. use a single weapon too much, and you'll find yourself with no more ammo for that weapon. there is enough amm available though, and you shouldn't have to rely on you blaster at all unless you are trigger happy or have poor aim. in terms of architecture, this map is breathtaking. each room, hallway, and area is crafted with care and abundant in detail work. 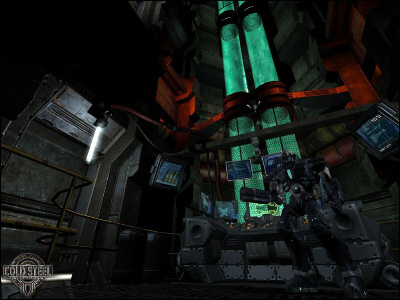 there are crackling fires, hissing steam, glowing computer screens and falling support beams adding life to each environment. the texture choices are very impressive and make each surface realistic and believable in appearance. i was highly impressed with the look of this level, as each and every location felt real. my screenshot doesn't do justice to just how good-looking cold steel is. the icing on the cake for this level are the cut scenes. from the introduction scene, to the 'combat' scene, to the 'strogg battle tactics' scene, these scripted moments add a professionalism and polish to the gameplay that is highly appreciated. while the battle scene carried on for a bit too long, overall this is high quality work and will help the player to become immersed in the gameplay. since this level is lacking in any kind of plot or story progression, the cut scenes are essential in making this level more than just another 'base full of strogg' map. it is great to finally see a user-created Q4 SP map. i hope this is but the first of many. eLusive has set the bar pretty high for future mappers. hopefully we will see more soon, but if not - at least we have this one very high quality level to enjoy. thanks eLusive!